Although there are many naturally motivated people out there in the world, let’s face the facts that you may not be one of them. Exercise means working hard, exhausting your body and forcing yourself to focus when it’s easier to let your mind wander, so it’s no surprise that it may not be your idea of a great time. So what would it take to get you in the mood to work out when you really don’t feel like it? 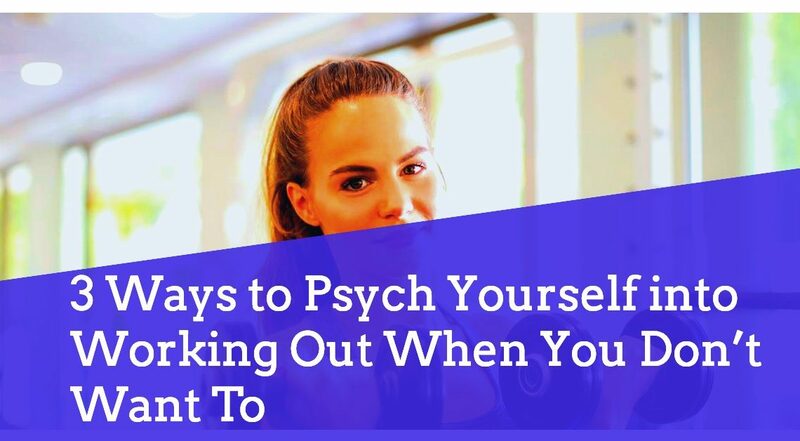 In my experience one has to “psych” themselves up to do something they would rather not do…so because I care and want good things for you I have devised a few tips here that will provide you with the much needed inspiration to get moving especially when you really don’t want to. I have followed this rule myself and have experienced wonderful benefits from it. If it seems too challenging to motivate yourself to work out for an hour, then tell yourself you’ll do it for ten minutes. Why? Because one of two things will happen. You will either get ten minutes worth of exercise (which is far better than nothing at all) or you will find the determination to keep going once you have gotten started. While it may be easy to put your work-out off while hanging around all comfy in your jammies…it isn’t so easy once you’re in fitness attire. The act of being dressed and ready to go whether you’re about to exercise or take care of any other task pushes you to take the first step in making it happen. What you are looking to do is connect yourself with your intention. If nothing else think of it this way…actors become most like the characters they play during dress rehearsal and the philosophy behind dressing like someone who works out is no different. If you want to get moving…dress the part. It’s MUCH tougher to slack off wearing a sports bra as opposed to your robe. Believe it or not, I have actually gotten motivated to work-out by watching other people doing just that. There have been times when I would flip through the channels on television and would come across one of the early morning exercise programs. I would watch what these fit people were doing, how they were moving and of course…what shape they were in and often enough it would inspire me to join in. I have also kept dumbbells around or perhaps my stability ball in the room to make sure they were available once the work out show encouraged me to want to learn a new exercise. The reason I feel this technique is so useful is because we tend to become what we pay attention to most of the time. While I know that many of you may have a treadmill that currently doubles as your dresser…once you get your exercise clothes on and tell yourself you’ll only endure the torture for ten minutes you may find within you more energy and enthusiasm than you initially realized. Here’s the hard truth: if exercise were easy and pleasant we would all be in the best shape and I wouldn’t have felt the need to write this article. We have to psyche ourselves into doing things we would rather not do because in the end, we all know what’s best for us. The next time you feel resistant toward your scheduled work out, try one of my tips.